AgPro™ Systems first and still most effective product for general soil fertility. This unique and superior enzyme complex is ideal for use as a soil management tool. Soils that have been heavily farmed, as well as new soils, can benefit from the rejuvenating action of RENEW™ which stimulates the microbial activity. This activity releases nutrients more efficiently enhancing plant production.RENEW™ can help improve various soil conditions such as soil compaction,fertilizer efficiency and nutrient release. This helps both the quantity and quality of yields. 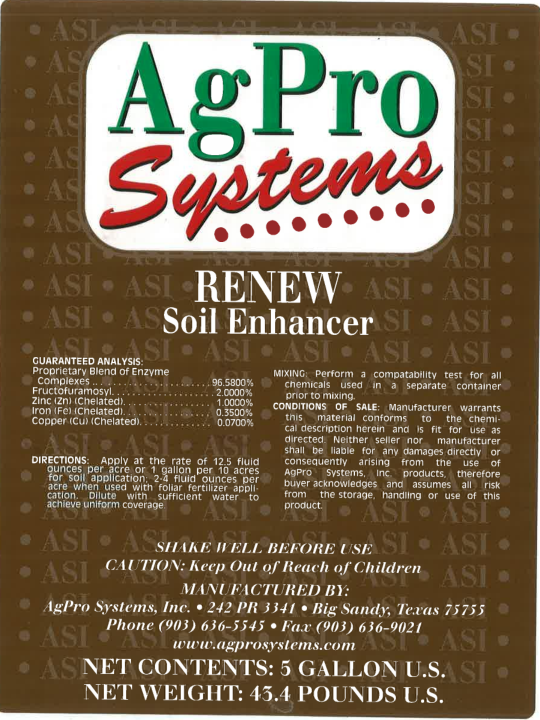 AgPro™ RENEW™ is a unique and superior enzyme complex designed for soil or foliar application. RENEW™ stimulates soil microbial activity which helps to reduce soil compaction, improve fertilizer efficiency and nutrient release. When used as a foliar treatment RENEW™ stimulates plant vigor. 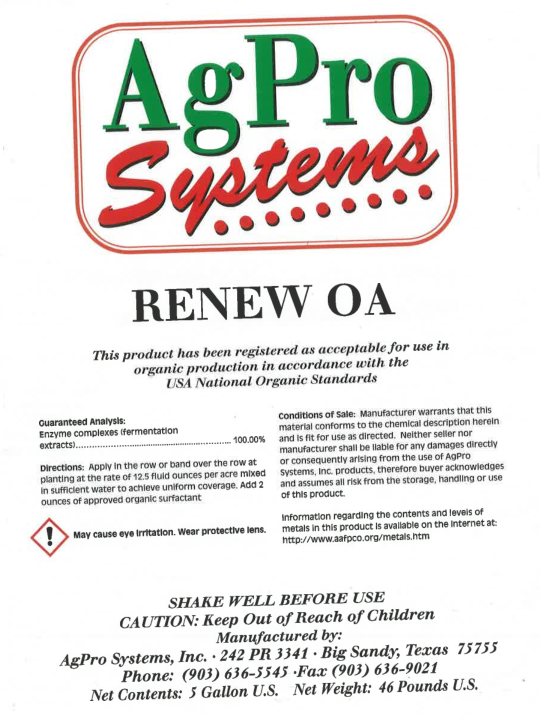 The organically modified version of RENEW™ complies with the standards of Organic Certifiers and contains only ingredients approved under the USDA National Organic Program. Please specify ‘organic’ if you wish the organic formulation. 10 fluid ounces in 5 gallons of water and apply at 1:75 to 1:100 through injector system. Using a siphon mixer, mix 2 fluid ounces in 5 gallons of water. Greens and Tees: 1 to 2 fluid ounces per 1,000 square feet. Fairways: 32 to 64 fluid ounces per acre. 1 to 2 fluid ounces per 1,000 square feet.